This item is part of a Milwaukee Promo that is valid until April 30th. With the purchase of this M18 Light, you can redeem a FREE T-Shirt & Hat from Milwaukee. 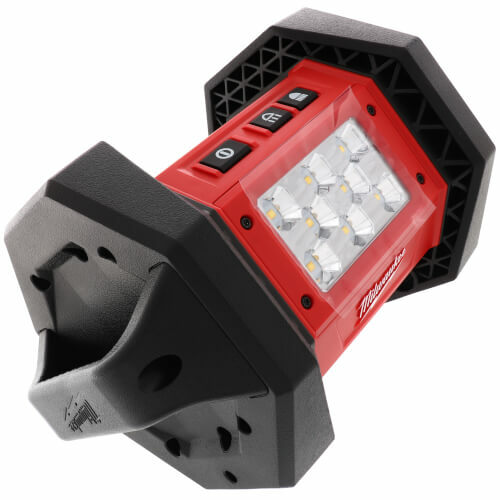 The Milwaukee® M18 Rover LED Flood Light delivers up to 30% brighter light output than corded 250W halogen lights. Designed to illuminate large workspaces on the jobsite, the cordless flood light uses 8 high-quality LEDs to provide 1,100 lumens and up to 1,300 lux. It’s powered by the M18 REDLITHIUM battery for up to 8 hours of runtime on a single charge. With its roll cage design and impact-resistant, replaceable lens, it stands up to the toughest working conditions. This compact flood light features an octagonal shape so the light may be used at multiple angles. The versatile hanger provides hands-free use in a variety of applications. The light carries a limited lifetime LED warranty.